Cantharidin from Andrew J. Schuman on Vimeo. Cantharidin preparations have long been used for treating warts of various sorts. It is a blistering agent and is available for purchase from a number of Canadian pharmacies as well as several compounding pharmacies in the United States. 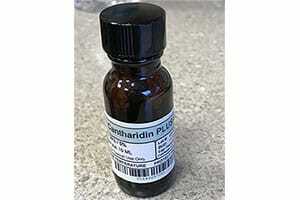 Cantharidin is available as a single agent liquid consisting of 0.7% of the cantharidin in a film forming vehicle. It is also a component of a more potent mixture commonly used for keratinized and plantar warts – containing 30% salicylic acid, 2% podophylin and 1 % cantharidin. These agents are available from Dormer Laboratories in Canada as Cantharone and Cantharone Plus. In pediatrics the advantage of cantharidin agents compared to liquid nitrogen is that it is pain free at the time of application. Cantharidin is not recommended for children under 3 years of age, and the more potent mixture is not recommended for children under 12 years of age. In general cantharidin is applied to the wart, allowed to dry and covered with a non-porous dressing which may be removed in 24 hours and replaced with a band aid. A blister usually forms within 24 hours. The patient is then seen in 2-3 weeks for debridement and reapplication. The cantharidin containing plus mixture is applied as above, but is covered with non-porous tape for 8 hours and then removed. As above a blister will form in 24 hours and the patient seen 2-3 weeks later for debridement and reapplication if required. Wart therapy is generally reimbursed at about $200 per visit, and these agents are generally available for less than $100 per bottle, enough to treat dozens of warts.